Our spacious Executive King Room invites you to slumber in style with cotton rich linens dressed upon a plush Serta Concierge Series Mattress with over-sized pillows and a bedside iHome docking stations within arm’s reach. This room offers a large desk with conveniently placed lighting and outlets with an ergonomic chair for comfort. 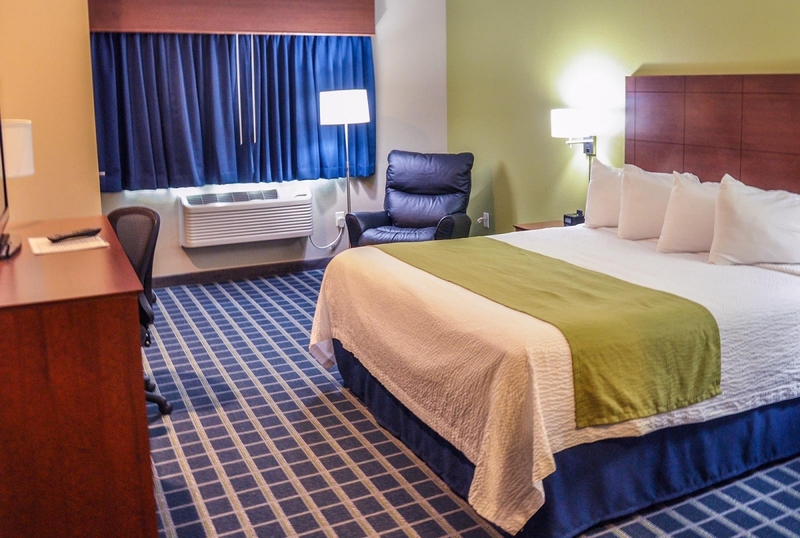 At Brookstone Lodge & Suites, Executive King rooms come standard with 39” LCD flat screen TV, leather recliner, a sitting chair, single serve coffee station, microwave and refrigerator. Tucked away in the closet you will find iron and ironing board. In the morning prepare for your day in the large bathroom with granite counter top and then head to our complimentary continental breakfast just off the lobby.